'It's time' • Lawmakers from 9 states gather in Utah, discuss ways to take control of federal lands. 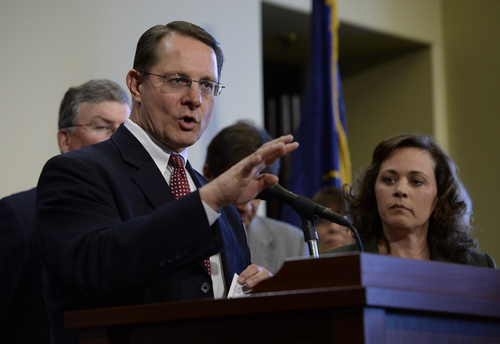 Scott Sommerdorf | The Salt Lake Tribune Utah Speaker of the House Becky Lockhart, right, and other western lawmakers spoke about their effort to transfer public lands back to the states, Friday, April 18, 2014. From left to right: Mark Blasdel - Speaker of the Montana House of Representatives, Montana Senator Jennifer Fielder, Scott Bedke - Idaho Speaker of the House, and Speaker Lockhart. Scott Sommerdorf | The Salt Lake Tribune Utah Rep. Ken Ivory, R-West Jordan, speaks while Utah Speaker of the House Becky Lockhart listens at right. They, along with other western lawmakers, speak about their effort to transfer public lands back to the states, Friday, April 18, 2014. Scott Sommerdorf | The Salt Lake Tribune Idaho's Speaker of the House, Scott Bedke, speaks as he and other western lawmakers describe their effort to transfer federal lands to the states, Friday, April 18, 2014. 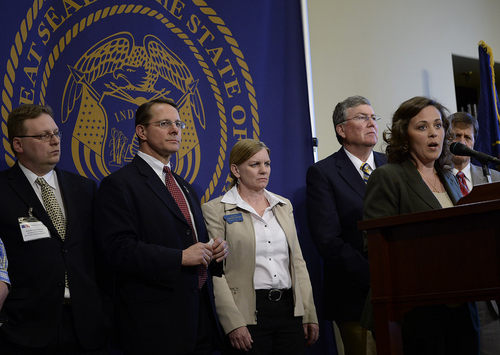 From left to right: Utah Rep. Ken Ivory, R-West Jordan, Montana Speaker of the House Mark Blasdel, Montana Sen. Jennifer Fielder, Bedke, and Utah Speaker of the House, Becky Lockhart, R-Provo. Scott Sommerdorf | The Salt Lake Tribune Utah Speaker of the House Becky Lockhart, right, and other western lawmakers speak about their private conversations on transfering federal land to the states, Friday, April 18, 2014. 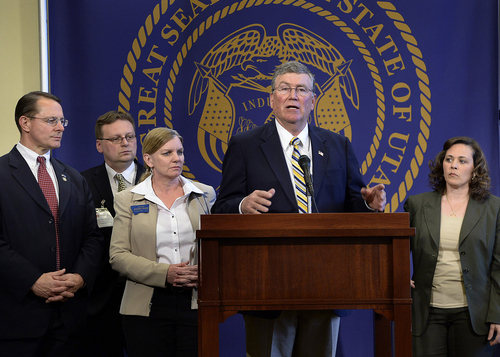 From left to right: House Speaker Mark Blasdel of Montana, Utah state Rep. Ken Ivory, Montana Sen. Jennifer Fielder, Idaho House Speaker Scott Bedke, and Lockhart. It&apos;s time for Western states to take control of federal lands within their borders, lawmakers and county commissioners from Western states said at Utah&apos;s Capitol on Friday. "It&apos;s simply time," said Rep. Ken Ivory, R-West Jordan, who organized the Legislative Summit on the Transfer for Public Lands along with Montana state Sen. Jennifer Fielder. "The urgency is now." The summit was in the works before this month&apos;s tense standoff between Nevada rancher Cliven Bundy and the Bureau of Land Management over cattle grazing, Lockhart said. "What&apos;s happened in Nevada is really just a symptom of a much larger problem," Lockhart said. "We have to start managing these lands. It&apos;s the right thing to do for our people, for our environment, for our economy and for our freedoms," Fielder said. "It&apos;s time the states in the West come of age," Bedke said. "We&apos;re every bit as capable of managing the lands in our boundaries as the states east of Colorado." Moreover, the federal government&apos;s debt threatens both its management of vast tracts of the West as well as its ability to come through with payments in lieu of taxes to the states, he said. Utah gets 32 percent of its revenue from the federal government, much of it unrelated to public lands. "If we don&apos;t stand up and act, seeing that trajectory of what&apos;s coming … those problems are going to get bigger," Ivory said.